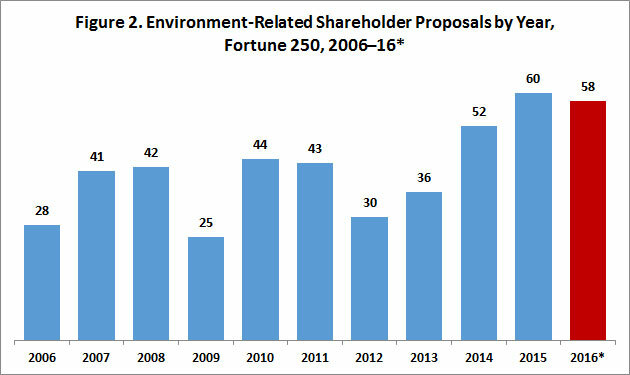 The number of environment-related proposals has been rising in recent years, and 2016—with 228 of 250 Fortune 250 companies having filed proxy statements to date—is on pace to set a record (Figure 2). 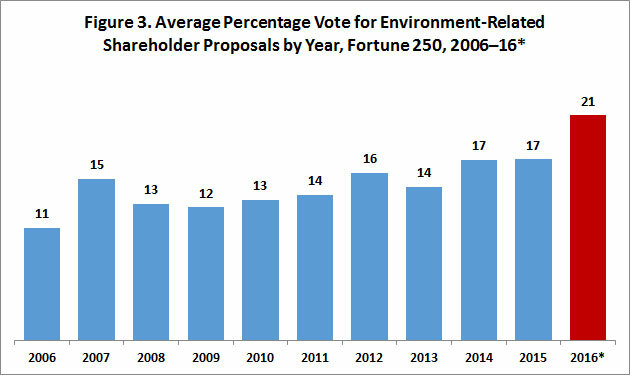 For all years covered in the Proxy Monitor database, not a single environment-related shareholder proposal has received majority shareholder support over board opposition; however, the average shareholder vote for such proposals is up in 2016 (Figure 3). 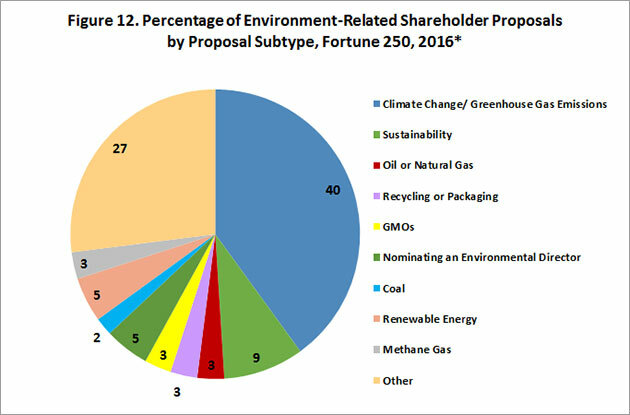 In addition, five environment-related shareholder proposals received at least 40 percent shareholder support (a record number); four of these five proposals involved climate change or greenhouse gas emissions. 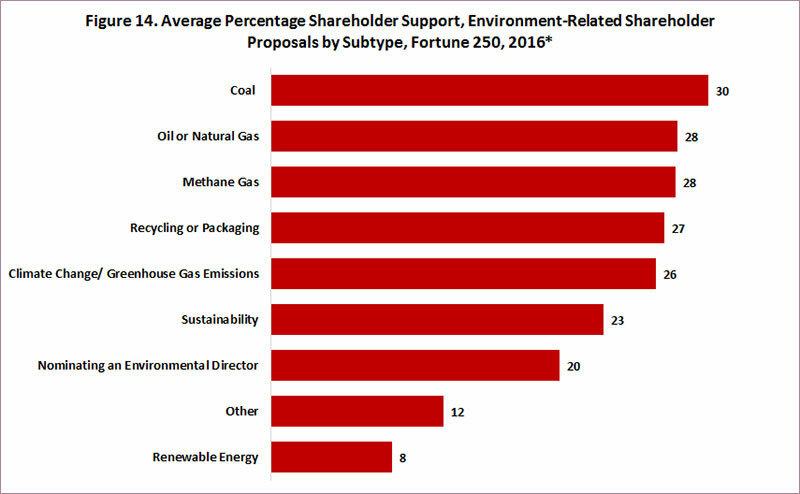 Overall, the 23 shareholder proposals related to climate change or greenhouse gas emissions voted on to date at Fortune 250 companies in 2016 received the support of 26 percent of shareholders, up from 16 percent support in 2015 and 14 percent during 2006–15. This finding explores the recent push by certain shareholders in light of overall climate-change activism and examines the 2016 proxy-access proposals and voting results in historical context. 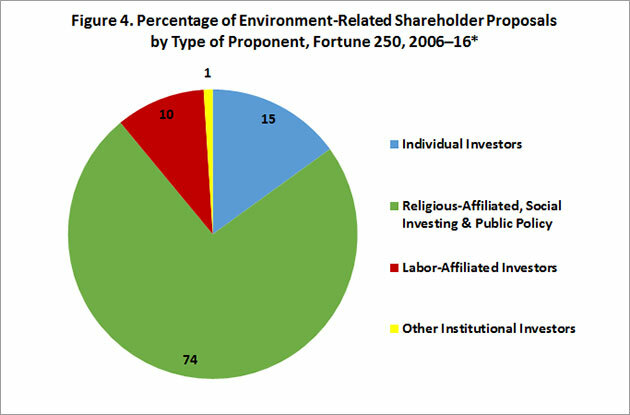 Since 2006, the first year covered in the Proxy Monitor database, the vast majority of shareholder proposals involving the environment (74 percent) have been sponsored by shareholders with a social, religious, or environmental purpose (Figure 4). 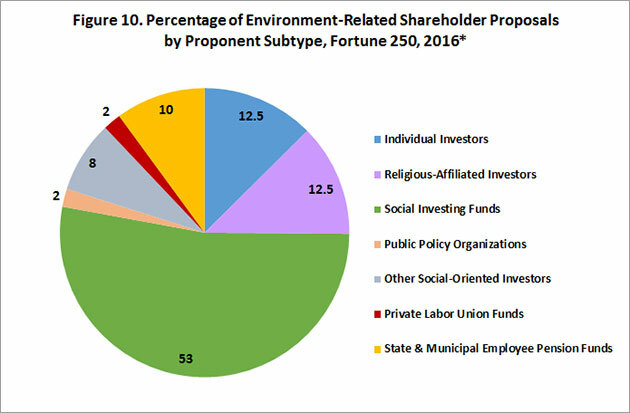 Social-investing funds—which focus on “socially responsible investing,” with an express purpose beyond maximizing share value—have sponsored 38 percent of environment-related shareholder proposals over the period (Figure 5). 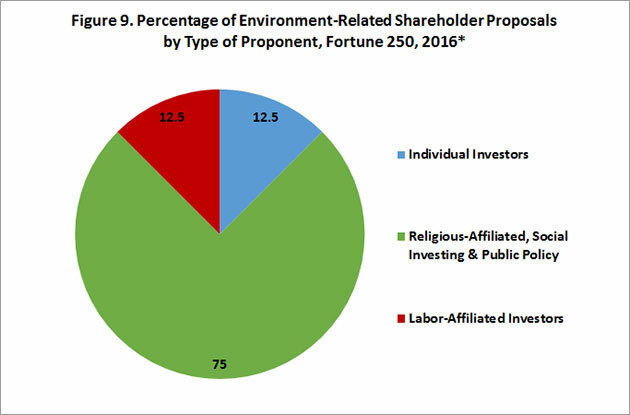 Religious-affiliated investors—typically, the pension funds of Catholic orders of nuns or other church-based institutions—have sponsored 22 percent of shareholder proposals in that time; and investment vehicles affiliated with public-policy organizations have sponsored 9 percent. 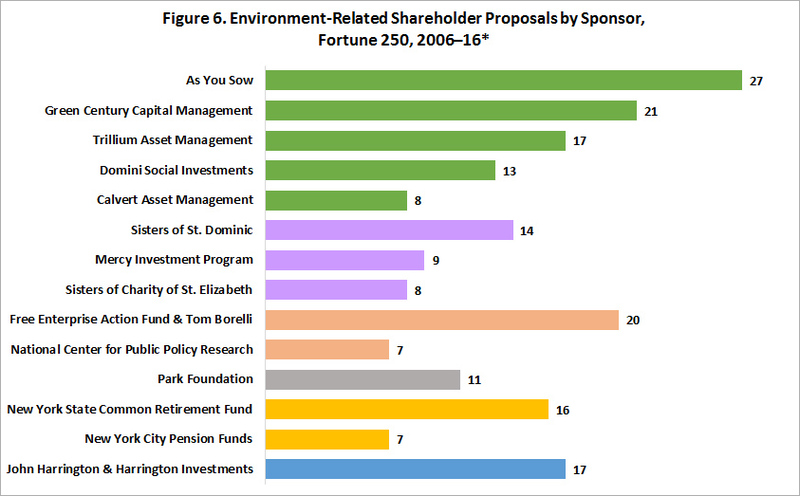 The most active sponsors among these social-oriented investors have been the umbrella social-investment nonprofit As You Sow, which explicitly focuses on shareholder-proposal activism; the social-investing funds Green Century Capital Management and Trillium Asset Management; the Catholic order Sisters of St. Dominic; and the Free Enterprise Action Fund, a policy-oriented investment vehicle organized by free-market advocate Tom Borelli (Figure 6). 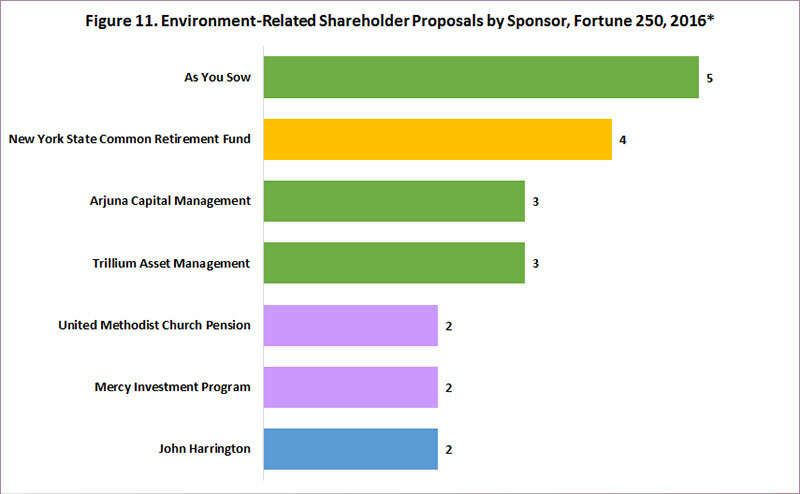 Other investors particularly active in sponsoring environment-related shareholder proposals include John Harrington, a “corporate gadfly” individual investor who also has a social-investing fund; and the New York State Common Retirement Fund, which holds assets in trust for the New York State & Local Retirement System. 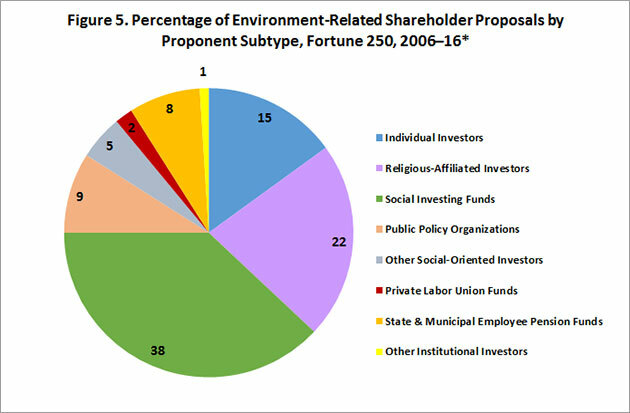 In 2016, 75 percent of all environment-related shareholder proposals were sponsored by institutional investors with a social-investing purpose or related to a religious or public-policy organization (Figure 9)—in keeping with trends over the broader period, 2006-16 (74 percent). This year, however, social-investing funds have played a larger relative role, sponsoring 53 percent of all environment-related proposals (Figure 10), compared with 38 percent for the period dating to 2006. As You Sow and the New York State Common Retirement Fund have sponsored the most environment-related proposals in 2016 (Figure 11). 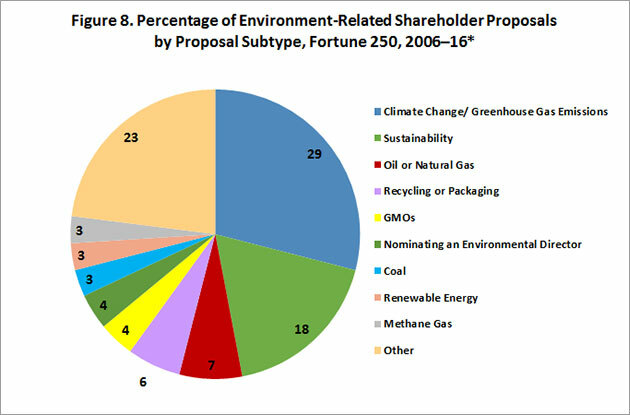 Forty percent of all shareholder proposals this year have involved climate change or greenhouse gas emissions (Figure 12), up from 29 percent across the 2006–16 period. 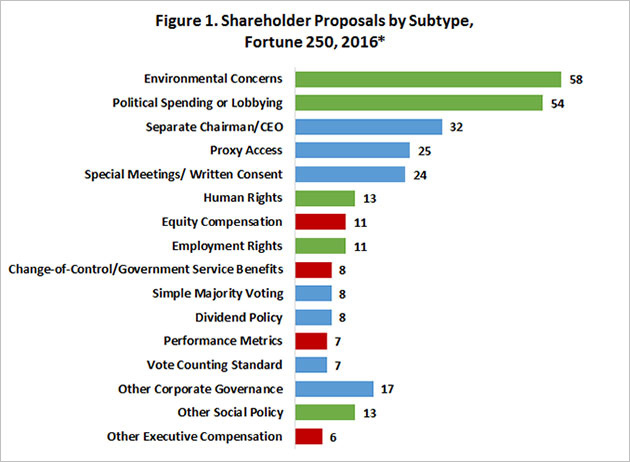 Notwithstanding this broader systemic shareholder-voting bias created by ISS, the proxy-advisory firm’s recommendations cannot explain the 2016 uptick in support for environment-related proposals: the proxy-advisory firm has not recently modified its guidelines for these proposal classes. 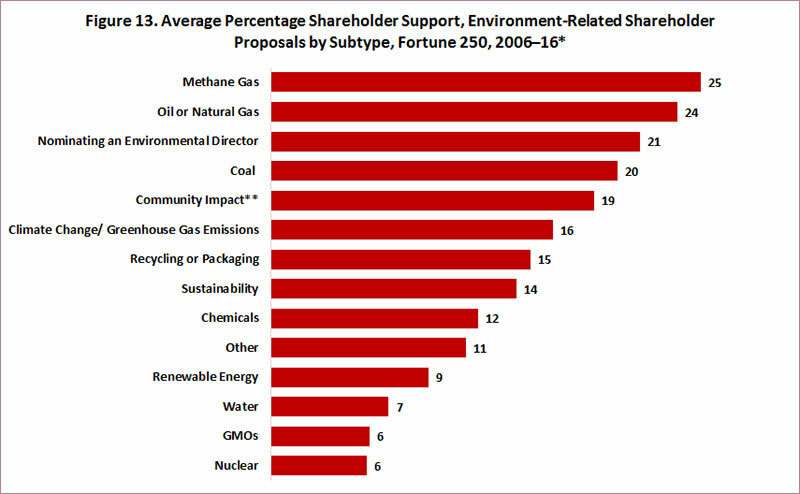 Moreover, although the uptick in support for environmental proposals has been modest, substantially more environment-related shareholder proposals in 2016 have received at least 40 percent shareholder support over board opposition: five in total, as compared with only two in all of 2006–15. 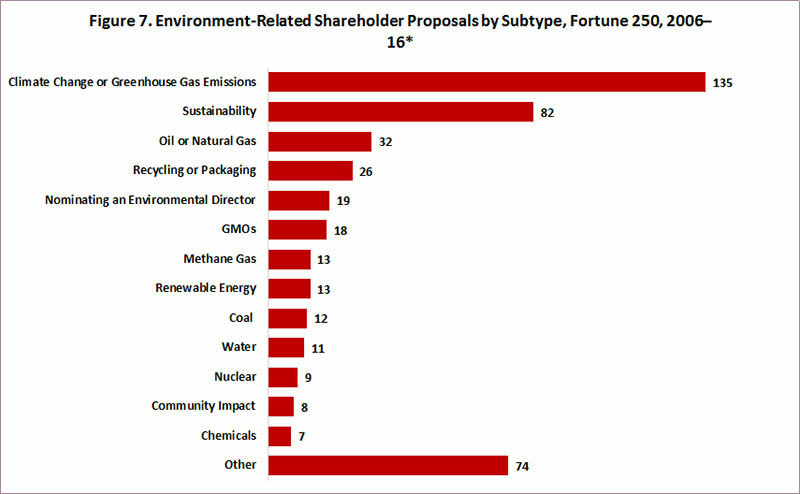 Four of those five proposals involved climate change or greenhouse gas emissions: two sponsored by the New York State Common Retirement Fund at Fluor Corporation and PPL Corporation, seeking reports on how to lower greenhouse gas emissions; and two by the pension fund for the United Methodist Church at Chevron and Occidental Petroleum, seeking a report discussing the companies’ climate-change policies and assessing the “short- and long-term financial risks of a lower carbon economy.” The increase in shareholder support for these proposals may be related to the extraordinary politicization of these issues by state attorneys general and other activists, and bears watching in the future.